Hi Zara. Can you explain a little bit about your background and how you got into music? Zara McFarlane: Hello! I grew up in Dagenham, Essex. I always loved performing as a child. I pestered my mother to allow me to go to dance classes and I had piano lessons from the age of eight. At 11, I started writing songs. I would put myself into competitions and ask to perform at school concerts, etc. There was always lots of music around the house – especially reggae and also some pop music, and when my family got together we’d have a good dance to reggae. When I was 16 I went to study Musical Theatre at the BRIT School in Croydon. I then went on to study a BMus in Popular Music Performance at the University of West London, and later an MMus in Jazz Studies at the Guildhall School of Music and Drama. While studying my undergrad I got involved with a company named Dune Records and started touring the UK and Europe with Tomorrow’s Warriors and Jazz Jamaica. I have toured with pop bands The Feeling and Noah and The Whale singing backing vocals. What artists influenced you growing up? 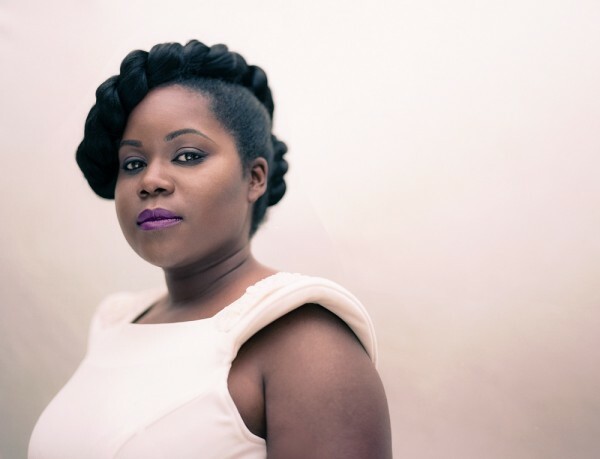 Zara McFarlane: Luther Vandross, Michael Jackson, Nina Simone, Lauryn Hill, Billie Holiday, reggae artists. Your excellent new album – If You Knew Her – comes out at the end of this month. What was the writing and recording process like compared to your 2011 debut, Until Tomorrow? Zara McFarlane: Very different! Until Tomorrow was a culmination of songs I had written over 10 years, therefore some of the songs had been around for a long time and evolved and changed. I really focused on creating an album that had a unified sound throughout the album and also felt that it was a true showcase of the entire band. Most of If You Knew Her consists of brand new songs. My main focus was to write songs with good melodies and strong themes and lyrics and then I focused on the instrumentation I felt suited each individual piece. I’m really excited to explore how these songs will progress and evolve within the live shows! You’re signed to Gilles Peterson’s Brownswood Recordings. Gilles has been pretty instrumental in your career so far, particularly at the start. What’s it like being a part of his Brownswood family? And how much input, if any, has he had in your latest album and shows? Zara McFarlane: Being on Brownswood is a great place for me because it is such a versatile label. It sits perfectly. I am free to produce the music that I want to and I also get the opportunity to have new versions of my music produced through remixes which allows me to dabble in different styles of music, which I love. I would say Gilles has had more input in this album then the first. His way of influencing me has been primarily sharing music with me for inspiration and then introducing me to different artists such as Matt Halsall and Leron Thomas. We worked on a few tracks with Matt and his band the one that was chosen for this album was ‘Angie La La’. You are going to be touring the UK throughout February. Can you tell us a little about what you have planned for the shows…such as the touring band and what you have in mind for the setlist? Zara McFarlane: My core band for the UK Tour consists of Reuben James- Piano, Max Luthert- Double Bass, Moses Boyd- Drums, Binker Golding- Tenor Saxophone. I plan to be performing songs predominantly from my new album as well songs from Until Tomorrow, my first album. Some of the tracks will be performed differently live than they are on the album – I hope everybody will enjoy the surprises! You have a truly powerful voice. Do you have any methods for training and maintaining it? Zara McFarlane: Thank you! I have studied Vocals so I try my best to warm up before shows and take care of my voice and general health to avoid getting colds as much as possible but late nights, early flights and general British weather makes it difficult at times! Having good breath-control and placement of tone is also important so you do not strain the vocal chords. I have seen you live a couple of times, including on a double bill at Ronnie Scott’s with trumpeter Matthew Halsall (who we are big fans of here at AAA). If I remember correctly, you joined him on stage to do a number together…any plans to record together? Zara McFarlane: Yes. We performed a piece we wrote together at Ronnies. For my album we worked on ‘Angie La La’ together and we wrote ‘The Games We Played’ together. We still have plans to work on some music together in the future. I actually last saw you at Gilles Peterson and Patrick Forge’s Another Sunday Afternoon at Dingwalls (my favourite day of the year! ), where you had Leron Thomas from NYC join you. How did you two become acquainted and what was it like to record your single ‘Angie La La’ with him? Zara McFarlane: I first heard Leron Thomas’ music through Gilles and it was my manager that suggested we get Leron to perform on the track. We sent Leron the music to put some ideas down and we loved what he came up with both on vocals and trumpet. We did not actually meet in person until a few days before the Dingwalls gig. We really had a great rapport and the live show just flowed. That was a really great gig! We actually filmed a little video of ‘Angie La La’ that day before the crowds arrived which is on YouTube. You also opened for American singer Dianne Reeves for her London Jazz Festival show at the Southbank Centre in November. That must have felt pretty special? 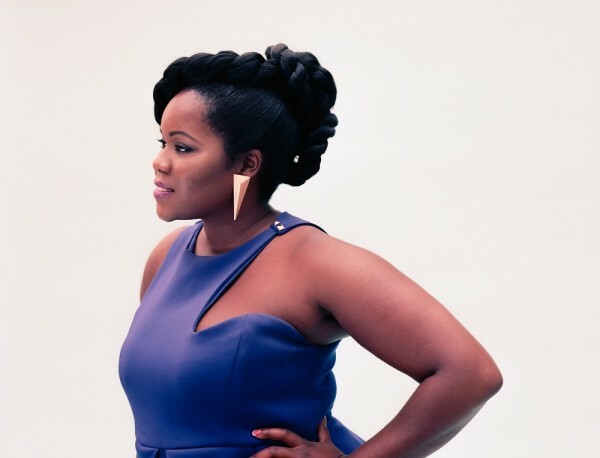 Zara McFarlane: That was quite surreal, performing in the Queen Elizabeth Hall with my band and getting to meet Dianne Reeves! When I first started singing with Jazz Jamaica, Janine Irons from Dune Records told me to listen to Dianne Reeves. I bought a few of her records back then, so have been listening to her over the years and it was really great to get advice (and compliments) from such an exceptional vocalist and performer. I read that you once auditioned for the X Factor. What was the motivation for appearing before the judges? It seems a million miles away from the relatively alternative and low-key attributes of the jazz world. Do you find the jazz and soul scenes restrictive of your ambitions in any way? Zara McFarlane: I have put myself into many different competitions over the years to gain experience and challenge myself. Study and competitions were the only avenues I knew how to get into music at the time, as I did not know anyone who was in the industry or who understood it. X Factor was just another competition and I was intrigued to know how it worked. But nothing happened with it. It was what I anticipated it would be and did not sit comfortably with me as I know I would have found that world far too restrictive. With regards to the Jazz and Soul scenes I do not feel they are restrictive. I have been able to explore many different styles within my career so far. I really enjoy experimenting with different styles of music/settings; live bands, duo, acoustic, produced, soul, reggae, jazz, soulful house, etc, and I plan to continue to perform in a variety of styles for as long as possible as it keeps the ideas flowing. Any plans to hit the UK festival circuit this summer? Zara McFarlane: Yes, definitely! Gigs are still coming in but I will keep you posted as plans start to firm up! And lastly, what are your aspirations for the future? Zara McFarlane: Oooh. More songwriting, including writing for other artists, writing a musical, new albums, exploring new sounds and styles, which I have not explored yet, some collaborations…just to start with! Oh, and touring the world – I’ve been getting a lot of love from Belgium, Holland, the US and Japan with this album already. Around Christmas time both USA Today and the LA Times featured my music! Which was a very nice Christmas present! Although you’re widely considered a jazz musician, much of your output, including many of your collaborations, are more closely connected to RnB and hip hop – particularly your work with the Robert Glasper Experiment. Are you more comfortable or aligned with any particular genre? 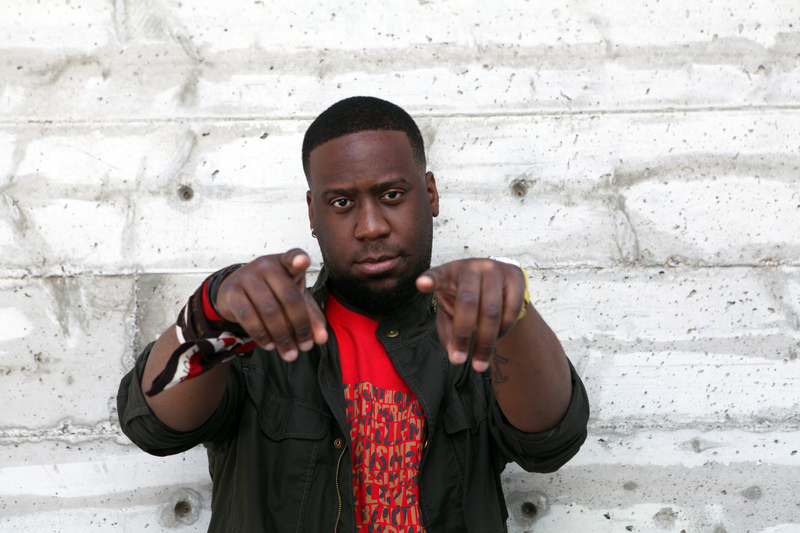 Robert Glasper: No, maybe I prefer jazz but I’m just as comfortable with hip hop and R&B. You’ve worked with so many iconic hip hop artists, such as Snoop Dogg, Common, Mos Def and Lupe Fiasco…Do you normally approach artists you admire and want to work with for collaborations, or do they tend to get in touch with you first? Robert Glasper: 50:50. Lupe sought me out – he heard ‘in my element’ on the plane, and he knew I knew Q-Tip, so got my number from him. Common sought me out, Mos sought me out, but I sought out Snoop. You’ve toured the Robert Glasper Experiment pretty extensively…I saw you performing at Wordwide Festival 2012 and Dour Festival 2013. Is there a permanent lineup for the touring band or does it differ from show to show, country to country? Robert Glasper: Band is the same. I’ve noticed that, at least with the Experiment shows, you are more focused on creating a collective groove with your band, rather than cramming in as many solos and free jazz interludes as possible. Would you agree? 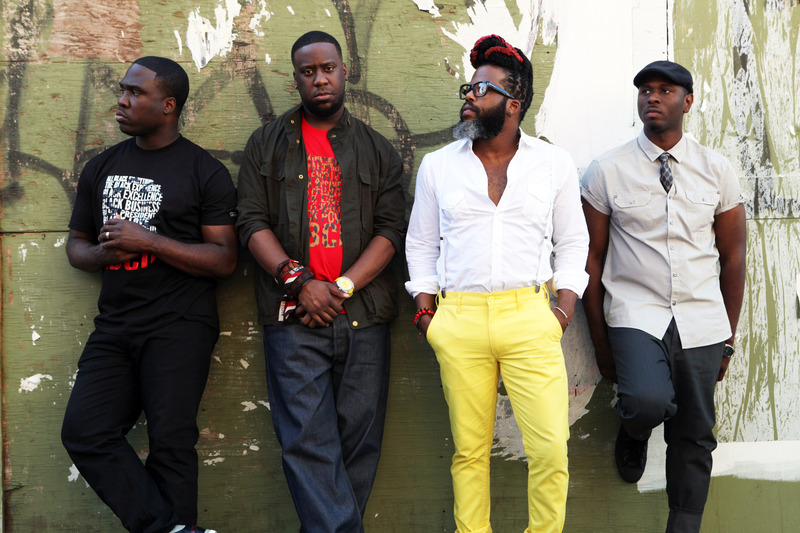 Robert Glasper: Definitely, the experiment is more groove oriented, and the Trio is more solos. The vibe of the Experiment is more of a collective groove. Here at AAAmusic we’re big fans of Jose James and Taylor McFerrin. Can you tell us about your time working with them? Robert Glasper: Jose is an old soul with new ideas; a good, fun guy. Taylor is a weird genius, a good dude. Taylor is very creative. You won a Grammy for your 2012 album Black Radio for best RnB album. What was it like to win? And do you consider Black Radio to be an RnB record? Robert Glasper: It was amazing to win, given the period of music that we’re living in. I consideredBlack Radio to be more of an RnB record than a jazz record, which is why I submitted it into the RnB category. You’ve just released a new album – Black Radio 2. Is this a sequel or to last year’s record, or a continuation of it? What are the main differences between the two, in terms of both the making of them, and also the resulting sounds and themes? Robert Glasper: It’s the next step, it’s a moving process, it has wheels – the main difference is that BR2 is more produced, and it’s more of a straight up RnB hip hop soul record, and also we concentrated more on originals than covers. Half of BR1 was covers. We always ask artists how they listen to music – physical vs digital, download vs streaming, etc. What is your take on the physical vs digital debate, from both a producer/recording artist perspective, as well as that of a music fan. As a touring musician it must be hard to travel with stacks of vinyl, for example, even if it is your preferred method? Do you have any plans to work on anything that would be considered conventional jazz? Can you recommend any new emerging jazz artists that we should check out? Robert Glasper: Christian Scott and Esperanza Spalding. 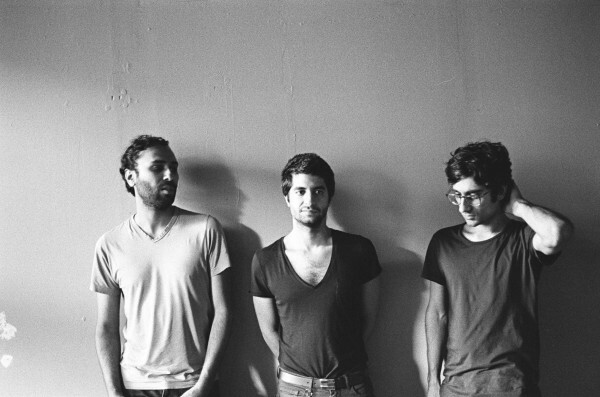 We are Dawn of Midi. Amino Belyamani on piano, Aakaash Israni on bass and Qasim Naqvi on drums. Amino was born and raised in Morocco, I was born in India but raised in America, and Qasim was born in the states of Pakistani descent. The three of us met at CalArts in 2006. I’m not sure what genre of music we make, but we’re influenced by anything that strikes our ear as good and makes us want to listen. 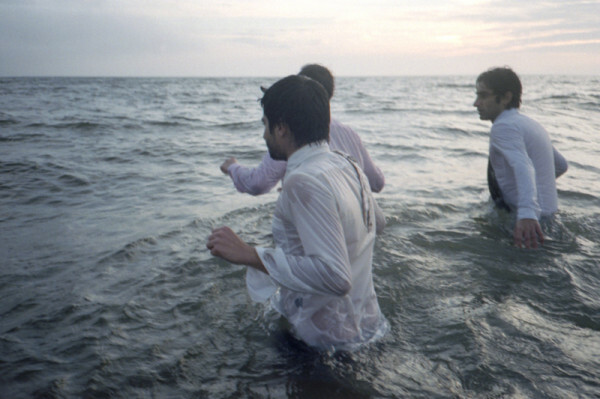 Be it widely known (Radiohead) or obscure (Ihya Boukdir). We’ve released three records, our debut 2010 entitled First, made up of completely improvised music. A 2011 EP Live consisting of improvised music recorded live in different concerts, and our 2013 sophomore LP Dysnomia, which is composed and conjures the looping rhythms of electronic music, but is performed acoustically. From what we’re told, Dysnomia is a pretty fun experience live; it is for us too. Our last concert, in New York, we opened for Jose Gonzalez’ band Junip at Le Poisson Rouge. Probably that our music doesn’t sound like it’s being made the way it is being made. When people hear Dysnomia, they usually think it is sequenced electronic music, not three guys on instruments with no effects. People should use Bandcamp, it is the best service for artists. iTunes is also a viable model to some degree, Spotify and the rest of the streaming services, while providing an amazing possibility for listeners to access so much music, cannot support the creation of new work. I prefer perspiration over aspiration because it takes place in the present. The EFG London Jazz Festival 2013 has seen some of the new breed’s most exciting artists, but none finer than American trumpeter Christian Scott. Tonight’s Ronnie Scott’s concert is by far the most exciting and memorable of the whole week; a singular triumph that encompasses both the true spirit of classic jazz and the fiery ambition of contemporary jazz. In an age where our young jazz performers are closing their craft in on electronica, RnB and post-rock, it’s beyond refreshing to hear an artist work in inventive ways without compromising the core elements of the genre’s beautiful history. 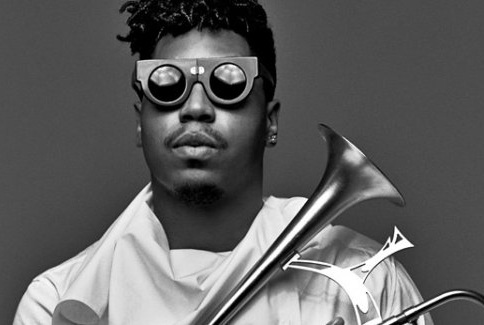 Christian Scott, just 30-years-old, is one hell of a stage presence. Hailing from New Orleans, he fills this prestigious, intimate venue with his confidence; all hip hop swagger, steely eyes and sultry smirks. As a band leader, he is authoritative yet surprisingly generous, often allowing his guitarist (Matthew Stevens), bluesy double bass player (Kris Funn), formerly of Kenny Garrett’s band, and snare-loving drummer (Corey Fonville, just 23-years-old!) to dominate proceedings while he nods in approval. Scott explains that he’s rather emotional, as tonight is the penultimate gig with guitarist Stevens, his collaborator of 11 years, who is off to start his new band. The influence of Stevens on both Scott’s recorded music and show is considerable, as his melodic, near-indie guitar lines are a large part of what makes Scott appealing to those unaccustomed to the trumpet jazz greats. There are almost as many guitar solos – which are incredibly intricate and at times border on avant-garde rock – as there are trumpet solos, and the second track aired tonight, ‘After All’ from 2010 album Yesterday You Said Tomorrow, was actually written by Stevens. When Christ Scott does solo, it’s explosive and visceral in a way that this reviewer hasn’t heard since…ever. He is this generation’s greatest jazz trumpeter, in my humble opinion. He plays his instrument, which is bent facing up, in a trance, and the sounds are transportive, often aggressive, without ever leaving the attendees behind. His rendition of Herbie Hancock’s ‘Eye of the Hurricane’ is sublime, as is his dedication to his wife, ‘Isadora’. Scott’s personality and humour shine through his many anecdotes, none more sincere than when he talks about his wife, who actually joins the band to sing Emily King’s ‘Georgia’. There is no love-drunk hyperbole in his declaration of her talent; she has a huge, soulful voice, and it’s delightful to see them riff off each other, staring adoringly into each other’s eyes. The highlight is main set closer ‘K.K.P.D.’ from Yesterday You Said Tomorrow, a politically charged composition referencing Scott’s encounter with immoral police back home when he was younger. It’s extraordinarily heated, with Scott’s notes erupting from his gut; occasionally he turns his back to blow his trumpet down into a second microphone facing up from the floor. It wasn’t just the highlight of the set, but the highlight of the entire festival. As an encore, Christian Scott invites the audience to join him on stage as they chant a ‘traditional New Orleans Indian call and response’ song – this includes the mighty pianist Robert Glasper who sidled in halfway through the set (only at the London Jazz Festival!). An intriguing finale to a storming set; Scott is in league of his own. With both of their ‘Orchestras’ programmed into this year’s London Jazz Festival – Submotion Orchestra last week and Hidden Orchestra tonight – Soundcrash (and the Soundcrash extended family) are safely riding 2013 out on a high, a year in which they have both cemented their status as London’s premier alternative event curator and significantly expanded their sphere of activity. Having been part of the Soundcrash fabric for some time (this reviewer first saw them supporting Daedelusat his 2011 Soundcrash KOKO show), this is Hidden Orchestra’s largest ever headline show in the capital – it initially was meant to take place at the diminutive Cargo before demand prompted a swift upgrade to The Scala. First up tonight, however, is a very special supporting guest: Czech producer-composer Floex (akaTomáš Dvořák) and his band, for what is apparently the band’s first show in London. And Dvořák couldn’t looked more elated to be here; his big beaming smile and humbled body language implies that if he could extend his arms around each and every attendee for one giant hug, he would. Accompanied by a full live band – including a solid drummer, bass clarinettist (who also utilises some kind of ‘wind controller’) and female singer – Floex shows just why he’s an artist’s artist, and what London has been missing by his absence. Dancing (literally) between electronic equipment, keys, percussion and his trusty clarinet, Dvořák and co. plough through extended versions of his Warp/Nina Tune influenced compositions. ‘Gone’ and ‘Nel Blue’, with their ethereal female vocals and trip hop underbellies, clearly influenced by Bonobo, are nice and chilled, while ‘Precious Creature’, with its pulsating woodwind groove, and a warped version of ‘Self Portrait #7’, which closes the set, best showcase the originality of their clarinet integration. At one point Floex is joined by members of his “favourite band” Hidden Orchestra, who he considers to come from the “same universe” as Floex (indeed he’s right! ), but adding trumpet lines to dual clarinets results in a bit of a muddled sound. Instead, the highlight comes courtesy of a revved-up rendition of ‘Mecholup’ from his 2011 Zorya album – it boasts the finest and most melodic clarinet lines of the evening, a grumbling, bassier undertone, and an inventive techno beat via Dvořák’s manipulation at his production desk. Soundcrash, please get Floex back to London for a headline show ASAP; they are more than worthy. Hidden Orchestra have come armed with a new AV show – and no, this doesn’t mean a white screen with projected images of landscapes or computer generated patterns, something that has become customary for live electronic music. H.O.’s show is the most inventive I’ve seen in some time: several groupings of white discs – some stacked horizontally and some placed in front of the band’s central desk, with one big disc placed high in the background – display intelligent, morphing images such as speakers, eggs, candles and live footage of the band, all controlled by an onset live AV manipulator. 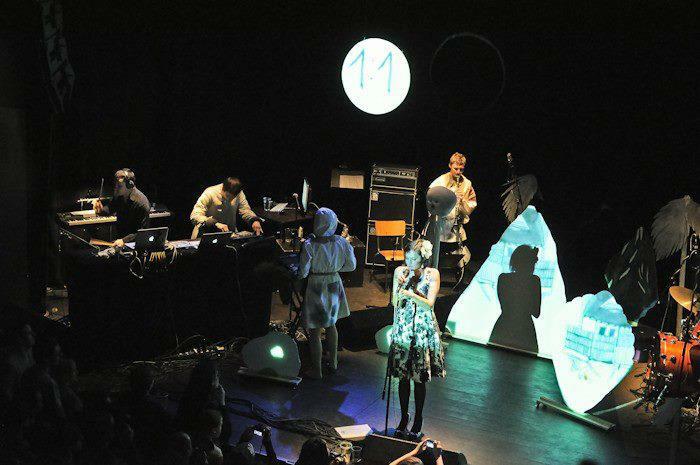 As interesting as the visuals are (and they are very interesting), what marks Hidden Orchestra out as a truly memorable live band is, of course, their music and choice of instruments. Mainman Joe Acheson (bass) and Poppy Ackroyd (violin, keys) are set up behind a desk of electronic equipment, from which they also control the mixing and samples, etc, as is their touring trumpet player who joins them for much of the set. Flanking the desk are two drum kits set up to face each other, from which drummers Tim Lane and Jamie Graham either fire different layers of intricate hip hop beats at each other, or, when the music is at its most climatic, hammer their drums in unison or take turns to smash out erratic fills or mini solos. 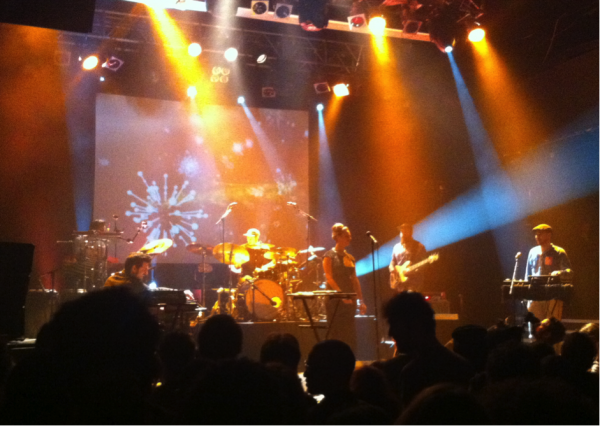 The band kick off with the opener of their 2012 album Archipelago, ‘Overture’ – a track that sums everything about H.O., from the brooding bass, trumpet murmurs, melodic strings and Portishead-esque beat; all of it slowly building from a quiet intro to a crashing, post-rock crescendo. From here on the setlist is pretty much perfect – the menacing dramatic movements of personal favourite ‘Reminder’, the bass-heavy wobble of ‘Tired and Awake’ and ‘Flight’, the latter containing oriental flutters, and the melodic contemporary jazz of ‘Seven Hunters’ are all played with perfection. The chords, pacing and effects on ‘Spoken’ are melancholic in a fine, Thom Yorke sort of way. Ackroyd’s little dances with her violin bow and shuffles when on keys are a joy to watch, and Acheson is convincingly genuine in his repeated ‘thank yous’ to the crowd. One of the set’s highlights is when Hidden Orchestra are joined by Floex (the man not the band) on clarinet for ‘Hushed’, a song they co-wrote “over the Internet”. The other highlight is main set closer‘Antiphon’, from their debut 2011 album Night Walks, which is hypnotic in a Portico Quartet kind of way, but with added classical drama – the dual drumming in the last movement is beyond thrilling. They reemerge to deliver what is fast becoming their standard encore, a little known B-side called ‘The Revival’, which boasts hypnotic violin squeals, rock drums and an aggressive bass core. This performance is nothing short of a triumph for Hidden Orchestra, a forward-thinking jazz-electronica fusion band who not only deserve their billing at year’s London Jazz Festival, but deserve to be commanding bigger audiences at grander venues. Medeski Martin & Wood have been making matchless music together for 23 years. Since the trio came together in New York, they’ve managed to become one of those rare entities in contemporary jazz – something of a crossover success. Not that John Medeski (piano/keys/organ), Billy Martin (drums/percussion) or Chris Wood (double bass/bass guitar) care for this kind of compliment; they never strived to push the boundaries of jazz. In fact, they would almost certainly argue that they never intended to be a jazz band in the first place, at least not a conventional one. MMW are rightly credited with helping jazz find new fans; fans previously concerned with only various types of rock music. 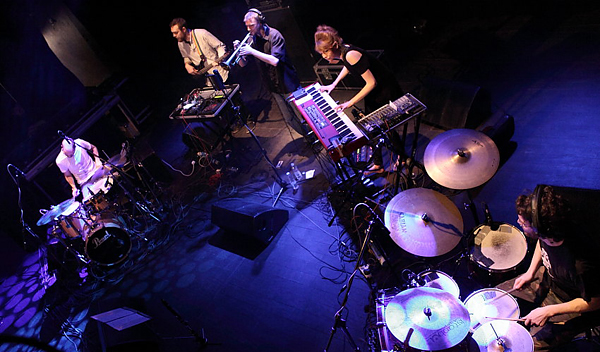 By adding elements of funk and blues, and firmly focusing any free jazz experimenting into or out of accessible grooves, the band have been able to dip their toes into what is loosely known as avant-garde rock (or art-rock, or art-noise, or something equally meaningless), acquainting fans of forward-thinking rock bands like Radiohead with a form of jazz they could comprehend. 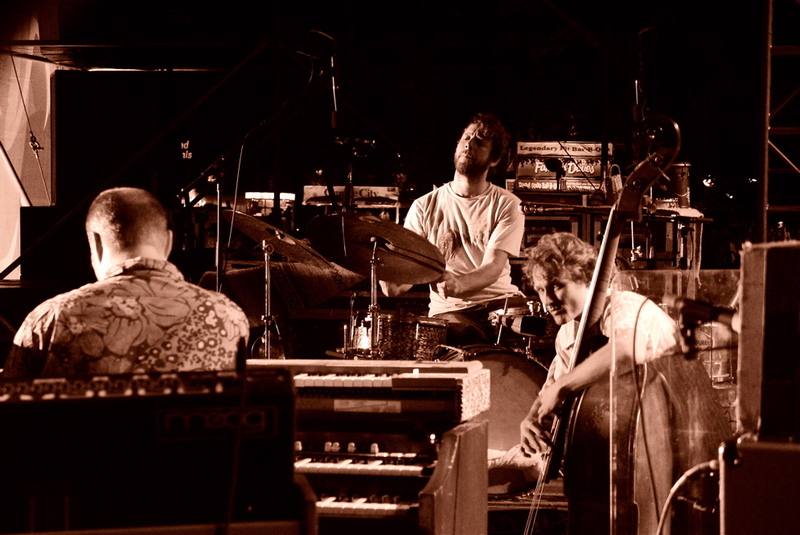 In my opinion, over the past 10-15 years, Medeski Martin & Wood have been at the forefront of popularising jazz-rock fusion in the mainstream, in the same way Flying Lotus has been so influential in promoting jazz out into international electronic music. It’s hard to believe that the trio had never headlined London’s prestigious Ronnie Scott’s until this weekend. These multiple shows (split across Friday and Saturday), which are part of EFG London Jazz Festival, are unusually intimate for Medeski Martin & Wood, who are veterans of festival main stages and outdoor venues. Having never seen the band perform before, I wasn’t entirely sure what kind of set to expect; MMW are renowned for doing improvisation-only shows, as well as acoustic gigs (which have been recorded in the past). However, tonight the Ronnie Scott’s audience is treated to a sublime blend of all the many ingredients that make this band so special. There are organ-heavy record tracks delivered with Medeski rocking out on his Hammond and Wood bringing the funk – perhaps the band’s most popular characteristic – on his bass guitar. There are more conventional jazz segments, where Medeski utilises his piano and Wood picks up his double bass, the instrument he looks most at home with. These are propelled by Martin’s solid, snare-favouring drums, which are never overtly ostentatious; he often prefers to create intricate soundscapes using a respectable collection of bells, chimes and shakers. And, of course, there are moments of inspired improv, where a restrained beat will become increasingly more off-kilter until it breaks down, either into truly captivating free jazz or an unconventional solo – Wood’s otherworldly double bass solo is hands down the best I’ve ever seen. The band end with an acoustic jazz-funk outro, with each of the band aligning at the front of the stage in front of their instruments – Medeski with a melodica, Martin on his double bass and Wood in a trance-like dance tapping inventively on a tambourine. It’s a smile-inducing end that garners considerable hand claps from the audience. 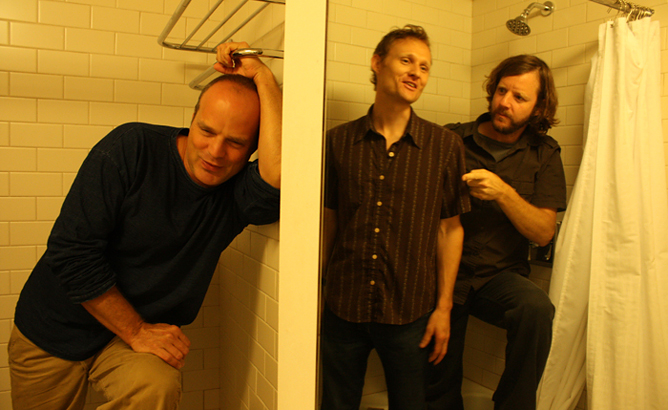 The endless use of the term ‘avant-garde’ has resulted in something of an assumption that Medeski Martin & Wood are uber-serious artistes, both uncompromising and withdrawn, whereas in fact they are a group of amiable mates striving to hit that fine line between entertainment and personal artistic satisfaction. With both band and audience looking elated after the encore, it’s fair to say that they hit that line tonight. Although loosely associated with the ongoing EFG London Jazz Festival, tonight’s headline show at KOKO is part of a nation-wide promo tour in support of Submotion Orchestra’s excellent new EP,1968. Nonetheless, this feels like something of a victory lap – a celebration of some greatly deserved 2013 recognition; a result of the sleeper success of last year’s Fragments album, which also warranted a headline appearance at this fine North London venue. There was something to prove at last year’s KOKO show – that they were worthy headliners, which, of course, they did with ease. Tonight, 13 months later, the jazz-soul-electronic-pop fusion seven-piece are back, with more confidence and live experience, not to mention some long overdue media support (that loose association with the London Jazz Festival can only have widened their horizons).